Choose your Dine In at the movies menu at your M&S *Dine In is available in selected stores and products may vary by store. Vegetarian (V), Vegan and Made Without options available. See in store for details. Menu correct at time of publishing. Offer runs from Wednesday 20 to Tuesday 26 February 2019 in selected stores in the UK. Subject to availability. See in store for details. 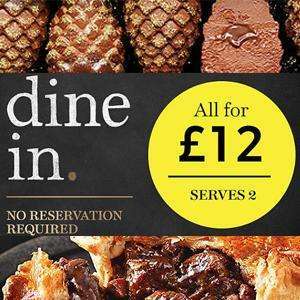 Choose a main, side, dessert and wine for £12. The inevitability that prices unfortunately rise over time - or portion sizes shrink. The inevitability that prices unfortunately rise over time - or portion …The inevitability that prices unfortunately rise over time - or portion sizes shrink. These meal deals are so disappointing. Maybe that’s why one of the dishes is named “Honey I Shrunk The Ribs”? I haven't seen the whole chicken in recent deals. These would have been good value at even £12 if you could still get the whole chicken ( The chicken itself would have been worth around £6 ) . PS: For those who don't know the Oakham chicken is just a marketing name for M&S chicken. But the welfare standards are better than standard supermarket chicken. Should they increase the price by 1p every week instead? To be fair they did hold the price at £10 for an awful long time, it was probably costing them money by the end of it, an £11 meal deal then a £12 one wouldn't have been right either. They did try to end this deal, but shoppers demand made them reinstate it, so I guess it's the market making the decision at the end of the day. To be fair they did hold the price at £10 for an awful long time, it was …To be fair they did hold the price at £10 for an awful long time, it was probably costing them money by the end of it, an £11 meal deal then a £12 one wouldn't have been right either.They did try to end this deal, but shoppers demand made them reinstate it, so I guess it's the market making the decision at the end of the day.